T.H. Moedriach, Prydori: Perfection is Us. Zaloznistvo Jerneja Jezernik, 2016. Pp. 180. ISBN 978-961-94032-4-2. $16.90. When I first held the book Prydori: Perfection is Us in my hands, I knew I was dealing with something different. The small (4 inches by 7 1/4 inches) hardcover volume seemed an unusual size, at least compared to what I’m familiar with, but I found it a very user-friendly setup for reading. The format provides great portability, and the nicely legible type on the small pages makes it seem, on the one hand, like you’re flying through the material. 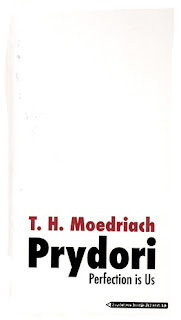 Countering that sensation of speed was the “weight” of the thoughts expressed, for I found Prydori to be a philosophical sort of book rather than a space-opera-type page-turner. Prydori: Perfection is Us is set in the 22nd century, when Earth is dominated by city-states, Prydori being among the most powerful. Though I was expecting a science fiction novel, in reality the book reads more like a series of short stories—almost vignettes. While some of the stories carry over characters from previous sections, others segments lack that tie-in. Continuity is provided by the fact that the stories all revolve around Prydori and its philosophies. The tales themselves are heavy on exposition—sometimes delivered through dialogue or monologue, but exposition nonetheless. Hence, Prydori had a stronger grip on my intellect than my heart. Still, the book contains between its covers a number of intriguing notions. For one thing, the author’s view of future society is interesting. We are introduced to concepts like the ubiquitous “iMan” drones/automatons, a supercomputer that manages traffic, power-rail cars called Enders, and the ability to communicate by telepathy, as examples. Moedriach depicts two streams of humans—Homo sapiens, or “Saps”, also referred to as “Old Humans”, and Homo novus, referred to as “Primes”, or New Humans. Many of the stories revolve around conflict between the two. Homo novus is perhaps one of the author’s more interesting creations. One of the characters early in the book, envisioning the New Humans yet to come, sees them as “smarter, more experienced and more mature in not only their behavior, but also their way of thinking… Unlike us they’ll learn from the stupidity of their mistakes, and from the good things they’ll create wisdom” (p. 29). And yet, this optimistic vision does not appear to come to fruition, for later in the book, Homo novus is depicted as arrogant, and possessed of an “ever present indifference toward other people” (130), among other faults. A race dubbed Homo Superior, “peace-loving people who don’t know violence” (150), makes an appearance in one of the stories near the end. Unlike 22nd century Prydori, this future iteration of humanity’s descendants, which we encounter on the planet Dar’Loom, live in harmony without the need for “societal rites, rules and norms” (150). This seems like the antithesis of the highly-structured Prydori, where everything is controlled, tracked, and regulated. In Prydori, there is “hardly any disorder but … also no individuality” (56). Art is “forbidden since it represented a potential danger for the state because it constituted a flow of creativity of thoughts and ideas” (56). Instead, citizens are encouraged to renounce self-initiative. Loyalty to the state is expected and demanded. Prydori prides itself on being perfect, for “in a democracy, in which there is no chaos, perfection has reached its final goal” (57). And yet, in one of the stories, Prydori is capable of experiencing chaos, in the form of a vehicle smash-up that theoretically shouldn’t be able to happen. In another story, the military builds a better mousetrap—with one fatal flaw. In a third, a scientist claims to have information that could save the world, but can’t get anyone interested in it. And so, Prydori’s very arrogance proves to be its undoing in more than one case. The world around us is in reality a different one. It’s one that is reflected from the inside out: it’s a created construct of our own awareness. A linked, or interrelated theme, is the difficulty in attaining true self-knowledge. Moedriach states, “We do not show what we truly are; that always remains a secret to the viewer; we only want to be perceived in the way that we would like to be” (147). Beyond giving us something to think about, Moedriach does some positive things to enhance reader engagement. Italicized passages serve the purpose of Shakespearean monologues, giving us an understanding of what is going on in the character’s mind. In other cases, Moedriach coins words specific to the novel, such as “Ender” (Energy Glider) (73), but provides a footnote to explain to the reader what the item, concept, or acronym represents. The technique is reminiscent of a research journal, but I didn’t mind it. I personally found the writing style to be somewhat uneven, and stilted at times. Rightly or wrongly, I attribute this to the fact that the book was originally written in German, and subsequently translated. There are some paragraphs or phrases that where the verbiage still sings, despite the fact that the words used aren’t the original language. For example, I enjoyed the passage, “Along with everything emerging comes the notion that it will all return some day to where it came from, as if it had never existed. It must be a colossal force that spits everything out, just to devour it all once again” (italicized in the original, p. 30). Examples where the flow of words didn’t work so well for me included, “Even the device essential for orientation was going crazy which took away any hope of following the correct direction” (124), and “She had only the possibility to move her upper torso away” (104). Some of these instances were merely awkward. In other cases, I found myself confused as to the intended meaning. 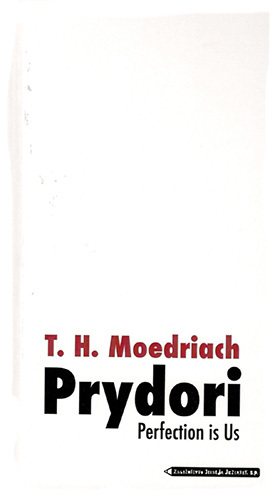 I didn’t find Prydori to be a book that engaged me viscerally as much as providing food for thought. Subheadings like, “Hell is our goal since we’ve already reached heaven” (31) gave me flashbacks to reading Waiting for Godot. If I had to pick one word to describe Prydori, it would be “interesting”. There are some instances of subtle humor and irony, but the philosophical nature of the stories and my sense of detachment from the characters mitigated the tension that normally draws me through a book. That being said, there are imaginative concepts contained within the covers. If you’re looking for a different take on where humanity may be headed, Prydori: Perfection is Us may be for you.